This collaborative course with Brooklyn Metal Works (BKMW) will begin in the Coldshop at UrbanGlass. We will explore different ways to manipulate pre-cut pieces of glass, or “blanks”, into carved and faceted segments. Students will learn to use the lathe, flat wheels, sanding belts, and dremels to achieve texture and a variety of finishes including the fabrication of glass doublets. Ultimately all glass will be transformed into small scale pendants in preparation to be joined with metal. The BKMW section of this course will teach metal fabrication techniques to create settings for the carved glass objects. The focus will be on jewelry applications to create pendants and earrings. Processes will include sheet metal and wire manipulation, sawing, filing, surface embellishments, and finishing of the metal. Both cold connections and high temperature silver soldering will be taught. 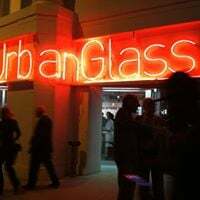 Class meets at UrbanGlass 3/22, 3/29 and 5/3. All other classes meet at Brooklyn Metal Works.